Square Enix has just had a blast this year as some on its tiles perform better in the market in terms of number of unit sold, the title which cross the million mark in terms of number of unit sold are Final Fantasy XIII, Dragon Quest IX and Batman: Arkham Asylum. 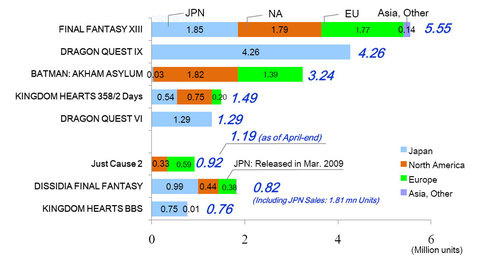 was Dragon Quest IX which sold a total of 4.2 million mark. The surprise entry was the Batman: Arkham Asylum which cross 3.4 million mark which is much much better performance than expected this unit were mostly send in US and Europe.